Last week when I was in the midst of planning my Franco-Indian Bastille Day Lunch based on Richard Grausmans' book French Classics Made Easy, from Workman Publishing, one of the recipes that really got my attention was a dessert. Lime Mousse. Now like anyone from my generation, I can't think about mousse with out thinking about this Moose. Bullwinkle J. Moose to be exact. Yeah I know it's juvenile, but I couldn't help it. In thinking about the lime mousse and how to give it an Indian translation, I only had one thought in mind and that was Kaffir lime. 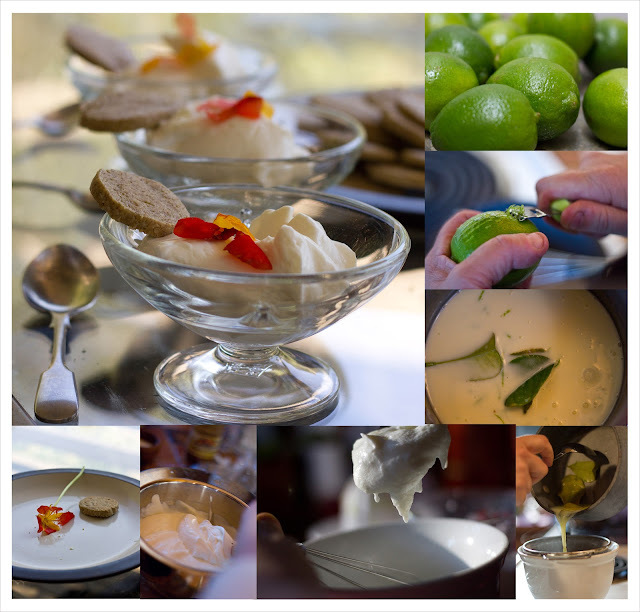 The Kaffir lime is used a lot in South Asian cooking and I've almost always used it in soups. It's one of the main ingredients in tom yum. It has a distinctive double leaf with a rather perfumy aroma. Now I've always had Kaffir lime leaves in my freezer (they're commonly found in all Asian markets) and I've always used them for savory dishes, but never a dessert. The idea of using them in a sweet course was really appealing. I'm nuts for floral scented dishes so this was right up my alley. I scouted around and found a couple of mousse recipes that seemed they would be candidates, and with a bit of modification on my part, I found something I liked. French mousse dishes use eggs and lots of cream. This Indian flavor version uses yogurt and a bit of cream and no eggs. It makes up fairly easily (1 hour) and it's a great make-ahead dessert. It sets up overnight and is ready to go the next day. Mix it together until the sugar is dissolved and then bring it to a simmer. Keep stirring, and when all the sugar is dissolved, take it off the fire, put a lid on it and let it steep for 30 minutes. Sprinkle 3/4 tsp of gelatin over the water lime juice mixture. 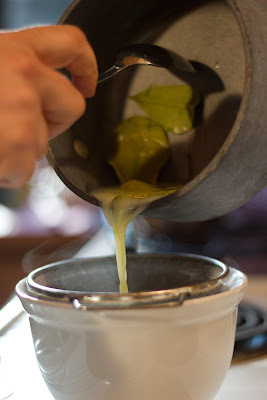 When it starts to get soft, heat the cream mixture again and pour it through a mesh strainer into the gelatin lime water. Press on it to get all the juices out, then mix it all together for about 1 minute until the gelatin is all dissolved. Put it all into the fridge to chill for about 25 minutes. Put a metal bowl to chill in the freezer. After 25 minutes pour 1/3 of a cup of cream into the chilled bowl and hand beat it into soft peaks. Yes, I did say hand beat. It's important not to over-beat the cream, that's why you use the 'by hand' method. I'd never done it before I made this mousse and it doesn't take long to get it whipped up so don't be scared. It does work, and just think how proud your grandma would be to see you do that. 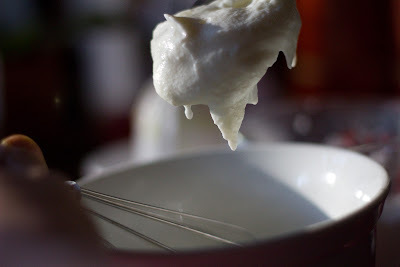 Once the cream is whipped, fold it gently into the chilled lime yogurt mixture. Cover it and place the whole thing back in the fridge for at least 8 hours. That's it. You're done. Perfect mousse. I loved this mousse and I'd never personally made any sort of mousse before, I'm planning on trying it with other flavors as it's so light and simple to make. I paired it with Bibi from Katmandus' Gluten Free Cardamom and Coconut Cookies and the flavors were perfect together. Lovely! I like kaffir lime leaf a lot and I think it goes well with the lime. I do not make mousses for the reason that some recipes call for raw eggs which I worry about. Like the fact that it has some yoghurt and not all cream. You know I am nuts about Basil, Shiso, and Keffir. I could taste this Mousse through the screen. yes and I was wondering about kaffir lime cream puffs too!! I've been searching for any Indian cuisine which my friend wants me to research about. I will try your recipe here and I will feedback later after I made it and lets see how it will taste. Thanks!